Protect your home with Custom Insulation’s Seamless Gutters. Not only are seamless gutters more attractive, they are more effective as well. Seamless gutters will protect your home from the excess water that pours off your roof during rain storms. The damaged caused by this excess water can ruin your fascia, soffit, foundation, landscaping and cause basement flooding. 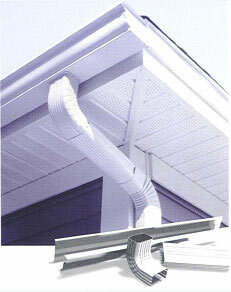 Custom Insulation Company, Inc. offers seamless gutters in 5 inch and 6 inch sizes. All seamless gutters are made with .032 inch thick aluminum. They are available in a variety of colors with baked on enamel to ensure beauty for years to come. Contact Custom Insulation for a complete list of colors that will match your home’s exterior. Custom Insulation Company, Inc. also offers The WaterFall Gutter Guard System as a way to protect your seamless gutters from debris and the need to clean your gutters.